There used to be simpler times when cheese was made locally and you generally knew what it was. But we do not live in those times, and we have a lot of food from all over the world on our table. Knowing a bit about it is not a bad idea. You can start by figuring out the difference between ricotta and cottage cheese. Ricotta is a type of Italian whey cheese made from the milk of goats, sheep, cows and Italian water buffalo. It is made by letting the whey sit outside and go through a long fermentation process (up to 24 hours at room temperature). After this fermentation process is done, the whey is heated to the point of boiling and then the curd is passed through a fine piece of cloth. The resulting cheese is grainy and sweet. Technically, ricotta is not a cheese, but a dairy by-product. It has a light texture and a slightly tart taste. 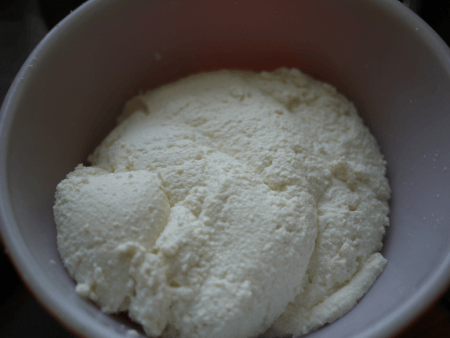 Cottage cheese is a mild flavored milk curd. The curd is drained of the acidic whey, which accounts for the sweet taste and light texture of the cheese. It is not pressed, aged or colored, and when made traditionally, it has the fat content of the milk used to make it. When made industrially, the fat is added separately to make whole fat, skim, and low fat cottage cheese. It is a highly versatile product that can be used in desserts, by itself or with salad. So what is the difference between ricotta and cottage cheese? Ricotta is made from the whey left over after cottage cheese is made. In fact, the product was invented specifically in order to find some utility for the large amounts of whey, just like cottage cheese was invented as a way to give a utility to the milk left over from butter production. 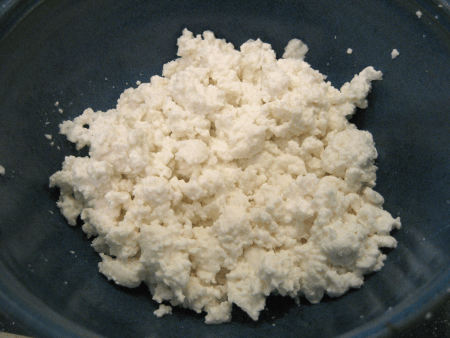 Cottage cheese is fresh curds from milk, whereas ricotta is made from curds harvested after the milk whey has been left to sit outside and ferment for about 24 hours. Cottage cheese is lumpy and soft, whereas ricotta is grainy. They also differ in taste, as the ricotta has high acidity due to the whey. Cottage cheese is sweeter, milky and creamy. They are both made by the collection of curds in a special cloth. Neither is pressed, aged or colored in any way. As far as Calories are concerned, ricotta made from whole milk can have up to 134 Calories, whereas the same amount of full fat cottage cheese only has about 90 Calories.